When I was younger my friend Myron said, "Moshe, you realize you are a control freak?" Truth is I had not. As I thought about it I realized he was correct. Over the years I have worked to balance my need for order, control and discipline in my life with the understanding that no matter what we do, we humans will never be in total control. There are greater powers out there. There is strength and wisdom in knowing when to let things be, to relinquish control. I have learned not to control the people in my life. I certainly cannot control the events surrounding me; the stock market, the dollar shekel exchange rate, the world economy. I do still try to maintain some control over my own life as I need the stability and security that control affords. With IKI, Israeli Krav International, these control issues become very important. 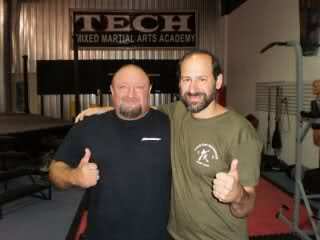 Most of our members are veteran instructors with established schools of their own. For those who want guidance, I am here for you. For those who want to be left alone I try to live by "The government that governs least; governs best." If an instructor joins IKI and he is already a high ranking black belt with a successful school, I will not attempt to tell him how to run his business. Not only does he have the experience but he is there on the scene. He knows his students better than I do; he knows his culture better than I do. I want everyone to learn gun techniques and I teach these straight from your first lesson. Other instructors feel that their students are not ready for that yet. They prefer to spend a few months on grab defenses, strikes, and conditioning. That is fine. These instructors feel that their students might be taken aback at seeing a gun during their first lesson. Who am I to judge? In some cultures guns are everywhere. Here in Israel every child sees handguns and rifles everyday. So when I teach gun defenses to children no one freaks out. Perhaps in another country, like some of the European countries, the citizens are not exposed to firearms, seeing a replica real life type of weapon might cause them to back away from Krav Maga altogether. I exercise quality control. I visit the schools when I can, test the students, test the teachers and make sure they are teaching authentic IKI techniques and not some commercialized watered down fitness style Krav Maga. In order to be an IKI school you must stick with the IKI techniques. Yet, I will not tell you that at week 7 all students must know 3 gun disarms and 4 knife defenses. I trust my affiliated instructors to exercise their own good judgment and experience. When they have questions they will turn to me. Some members feel I do not exercise enough central control. They want lesson plans. If so please contact me and I will work with you for a plan that best suites your students. I will need to know some information about them and then we can work together. My teacher had a curriculum for ranks but over the years I discovered that it did not work for me. The younger students could not do the techniques that demanded fine motor coordination beyond their young abilities. The older students could not handle the flexibility demands and the conditioning/fighting requirements. I soon realized that I had to adjust the curriculum for my own students based on my first hand knowledge of their needs. IKI does not try to impose a "One size fits all" curriculum. The bottom line is people need to learn the techniques and be able to defend themselves. How to best implement the techniques depends upon the individual instructor and student. As it says in the book of Proverbs, "Educate the young man according to his own way and even as he grows old he shall never deviate from it." That is the best advice I can offer. Many high ranking martial artists from other styles have joined IKI and are on their way to becoming accredited Krav Maga instructors. With their new skills they are helping many others defend themselves.